Please read the enclosed leaflet carefully before use. Dosage: For oral use: Adults and the elderly: For the symptomatic relief of mild anxiety: Take two 5ml spoonfuls three times a day with water or a fruit juice if desired. 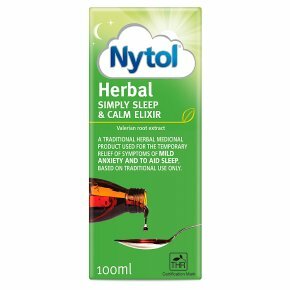 To aid sleep: Take two 5ml spoonfuls 30 minutes before bedtimewith an earlier dose during the evening if necessary. Maximum daily dosage: Four single doses. Do not exceed the stated dose. Warnings:<br>No recommended for children or those under 18 years old.<br>Do not drive or operate machines if you feel sleepy.<br>Alcohol may increase the effects of this product. Therefore excessive alcohol should be avoided.<br><br>Do not take this medicine if you are:<br>Allergic to any of the ingredients<br>Pregnant or breastfeeding<br>Already taking medicine for sleep or anxiety<br><br>Consult your doctor before taking this medicine if you are:<br>Suffering from alcoholism as this product contains alcohol<br>Intolerant to some sugars as this product contains sucrose<br><br>If symptoms worsen, or persist after 4 weeks, consult your doctor or qualified healthcare practitioner.<br><br>Do not use if the security seal is broken.<br><br>Keep out of sight and reach of children.